Welcome to Cirque de Flambé! Cirque de Flambé literally means the Circus of Flame. 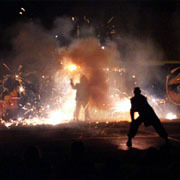 It is a unique spectacle that has combined for the first time on any stage flaming feats of human endurance combined with the madcap hilarity of fire clowns, set to live music and presented in a one-ring style European circus. This show, unique in the world, has delighted audiences in cities across North America. 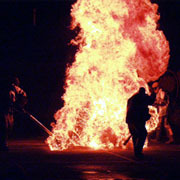 The Exploits of the Cirque de Flambé have been seen at festivals such as Burning Man, Edmonton Fringe Festival, Utah Arts Festival, Desert Blast, Seattle Fringe Festival, Arts Edge, WOMAD After Dark, First Night to name a few. Members of the Cirque de Flambé have been featured internationally on Fox Television, Ripley's Believe It or Not!, BBC, Discovery Channel. These Masters of fire from Fremont have worked their combustible magic to present the wildest show they can show on a stage. You will be in awe when you see what they can do before your very eyes. 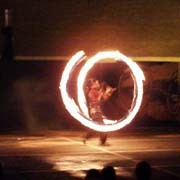 Feel the awesome power of a 30 foot cyclone of fire as it leaps to life before your eyes! See before your eyes, a comet smash into the stage! Witness trained animals as they work with fire! 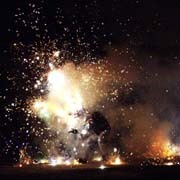 Watch the astounding agility of pyro professionals! Delight in watching actual clowns being burned! For more information on this fabulous show that has been described as, "More circus than you see at a fire, more fire than you see at a circus!" For more information and booking opportunities, contact the Cirque de Flambé!